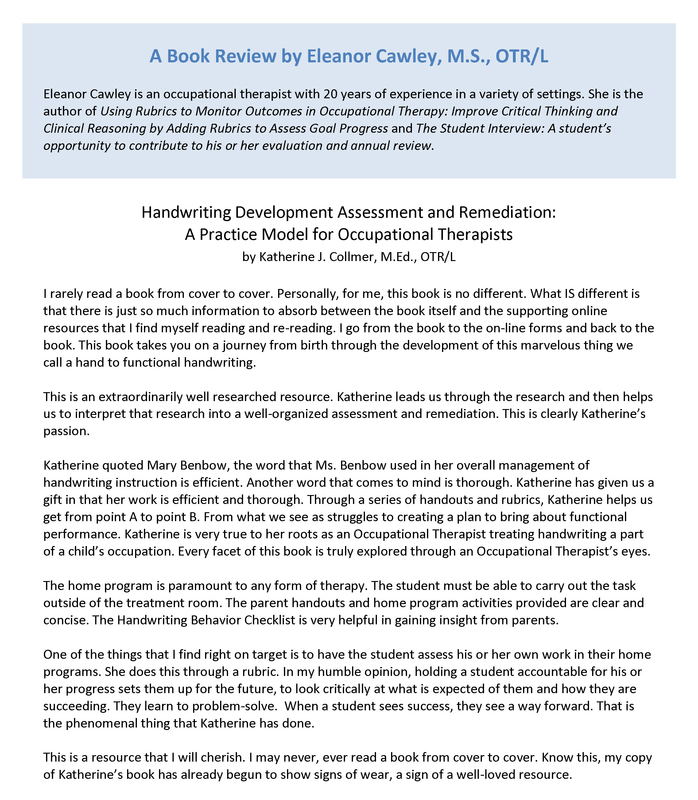 Handwriting Development Assessment and Remediation: A Practice Model for Occupational Therapists is a comprehensive guide for occupational therapy students, as well as newly graduated and experienced pediatric clinicians. Katherine Collmer, M.Ed., OTR/L, created this textbook resource to provide a consistent tool for assessing handwriting development skills and developing a remediation plan for addressing problem areas. She also provides essential handwriting skill development research and information about the role that handwriting plays in literacy. The step-by-step guide to the assessment and remediation process offers detailed information about using the assessment tools, gathering and analyzing data, formulating remedial goals, selecting therapeutic strategies, and implementing the remedial treatment plan. Therapeutic strategies are offered in the form of handouts to facilitate the development of home activity plans to enhance the carryover of skills. "There is just so much information to absorb between the book itself and the supporting online resources that I find myself reading and re-reading. I go from the book to the online forms and back to the book. This is an extraordinarily well-researched resource." - Excerpt from book review by Eleanor Cawley, M.S., OTR/L. Read the full review here.